Shipping is calculated on the checkout page before you pay. Free shipping is available to UK customers on all orders. Free shipping is available to overseas customers on orders placed of £15 and over. Please see Shipping & Returns for more details. Orders are posted within 1-3 business days using Royal Mail Standard postal services – 1st Class mail for UK orders and Standard International for everywhere else. Times vary depending on where in the world you are ordering from. Please be aware that these are estimated shipping times and unforeseen circumstances can sometimes delay items, especially when shipping overseas. Manic Minotaur will do his best to meet these shipping estimates, but can’t guarantee them. To keep shipping costs low orders do not come with tracking. Tracking is available at an extra charge. Please Contact Us to find out more. Payments are processed securely via Paypal which accepts all major credit cards. You don’t need a Paypal account and can checkout as a guest. Are you available for artwork commission? Yes. 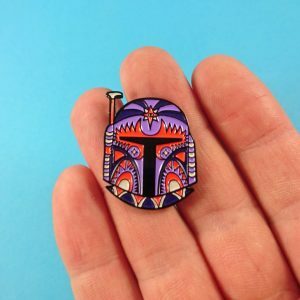 Manic Minotaur loves to create custom artwork for both on and offline uses. 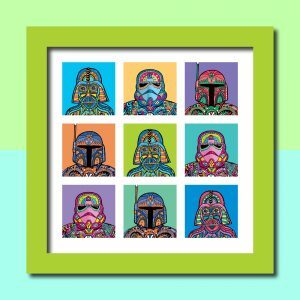 Please head over to manicminotaur.com to see lots of great artwork or Contact Us to find out more. Yes. 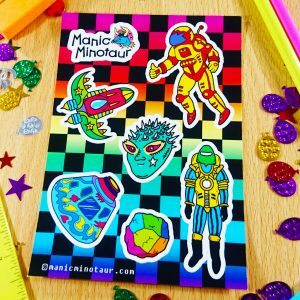 Manic Minotaur supplies greeting cards and some other items to various stockists. How does Manic Minotaur keep his horns so shiny? He uses a special polish that can only be found within the mouths of oysters off the shores of Crete.